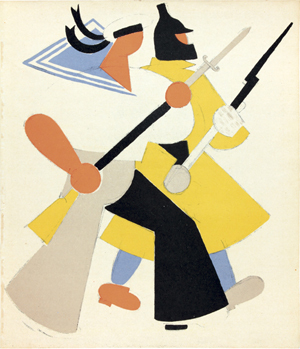 The first monographic exhibition in Spain devoted to the Russian Soviet artist Vladimir Lebedev (1891–1967). Featuring over one hundred works–including drawings, revolutionary posters, sketches, and illustrated children's books–the show is drawn largely from the Merrill C. Berman Collection, New York, and the Bibliothèque de l'Heure Joyeuse, Paris. Lebedev, whose work is held by major collections and museums worldwide, is only partially known outside his native Russia. The present exhibition does not intend to showcase the artist's entire output; rather, it aims to serve as an overview of his extensive career. The central theme is the artist's indisputable talent as a revolutionary draftsman and graphic artist, but at the same time it presents one of the better known aspects of Lebedev's oeuvre, his outstanding work as an illustrator of children's books. Trained as an artist in Saint Petersburg, Lebedev's talent soon came to fruition following the October Revolution of 1917 and the ensuing establishment of the Soviet regime. It was then, between 1920 and 1922, that he began drawing the famous ROSTA "windows" —posters produced for the Nothern Region Office of the Russian Telegraphic Agency, or ROSTA, the acronym commonly used to refer to the soviet agency, where Lebedev was assistant head of the poster department at the Petrograd office. Inspired by traditional woodcut prints called lubki, Lebedev's "windows" reveal the artist's early experiments with Cubism and Futurism, two fundamental influences in his varied career as an avant–garde and revolutionary artist and as a promoter of both abstract and realist art. Also on view is an extensive series of ink drawings and watercolors revealing Lebedev's mastery of so–called "figurative drawing", as a medium for social commentary and criticism as well as a meditation on the female form. Perhaps the best known facet of Lebedev's career–his exceptional work as an illustrator for children's books–is well–represented in the exhibition and its accompanying catalogue. As the art editor for the Detgiz Publishing House in Leningrad from 1924 to 1933, Lebedev not only commissioned illustrations from numerous artists but he himself–throughout a lengthy and fruitful collaboration with the writer Samuil Marshak (1887–1964)—illustrated dozens of Marshak's children's books, many of which can be seen in the present exhibition.